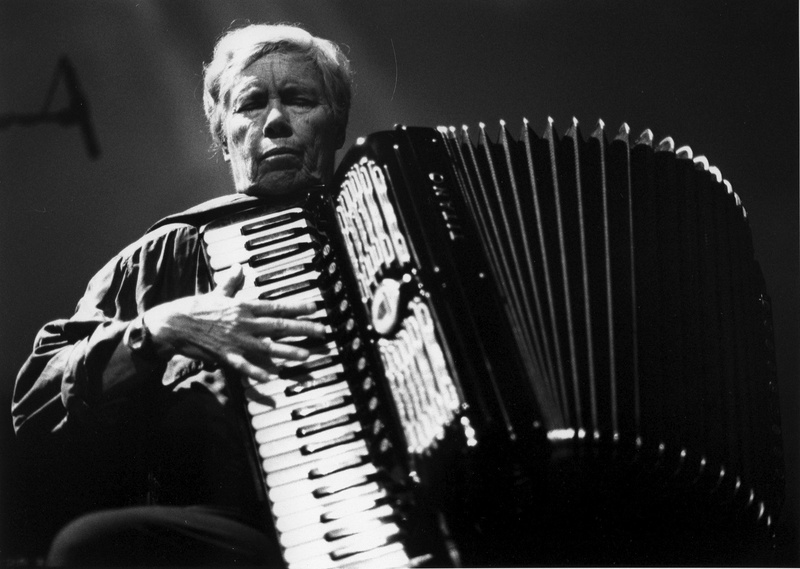 Pauline Oliveros (1932) has influenced American music extensively in her career spanning more than 60 years as a composer, performer, author and philosopher. She pioneered the concept of Deep Listening, her practice based upon principles of improvisation, electronic music, ritual, teaching and meditation, designed to inspire both trained and untrained musicians to practice the art of listening and responding to environmental conditions in solo and ensemble situations. During the mid-’60s she served as the first director of the Tape Music Center at Mills College, aka Center for Contemporary Music. Since 2001 she has served as Distinguished Research Professor of Music in the Arts department at Rensselaer Polytechnic Institute (RPI) where she is engaged in research on a National Science Foundation CreativeIT project. Her research interests include improvisation, special needs interfaces and telepresence teaching and performing. She also serves as Darius Milhaud Composer in Residence at Mills College doing telepresence teaching and she is executive director of Deep Listening Institute, Ltd. where she leads projects in Deep Listening, Adaptive Use Interface. She is the recipient of the 2009 William Schuman Award from Columbia University for lifetime achievement.Recent recordings include Pauline Oliveros & Miya Masoka and Pauine Oliveros & Chris Brown on Deep Listening. In 2012, she received the Giga-Hertz-Award for Lifetime Achievement in Electronic Music from ZKM, Center for Art and Media as well as the John Cage Award from the Foundation of Contemporary Arts. To open in the spirit of your work: Key tap and refrigerator hum, sweet silvery sound of tinnitus, robin calls and sparrows through the trees, black dog bark, bottle clink into a neighbor’s bin, plush air of cars passing, blue note of a wood dove, whirr of a motorbike, somewhere a plane climbing the sky…and it goes on…. Pauline:  What I am hearing now is coming into consciousness slightly after the sound has happened. I have experienced the sounds before any kind of identification. Once description or identification starts I am no longer listening. I feel the density of the humid air in my ears as thrashing molecules. The so-called quiet around me has the low thrum of the refrigerator motor vibrating through the floor from the kitchen with voices from the radio faintly filtering through. MS:  One of the most compelling aspects of art is that it offers heightened experience, but this usually remains within a rather static, stilted relationship of object/artwork and subject/viewer. Part of the beauty and power of your work is that you revel in the understanding of everything as innately interplay. In many of your live works you invite participation, in which the audience become performers and the artwork becomes a shared process of intensified experience. And your recorded works model/transmit the feel of improvisational listening, with its open flows of waiting, of call and response, so that the audience-listeners’ senses are refined through experiencing the album. Can you share your thoughts on art/your work as (heightened) experience? Pauline:  Wholeness of attention and awareness brings about the possibility of heightened experiences in arts performance, improvisation and composition. What I mean by “wholeness” is complete immersion in the here and now. “Heightening” of experience is then possible as interplay of attention and action. MS: What about art as transmission, as awareness that is shared/received? Pauline: With wholeness of attention and awareness transmission is shared and is likely to be received. Pauline:  All of this work falls under the umbrella of the Deep Listening Institute, which has been offering workshops and retreats two decades now. What new things are underway right now/becoming its future? DLI just completed the first Deep Listening: Art/ Science international conference at EMPAC, RPI in Troy NY July 12-14. There were 75 presentations and 110 registrations. This conference brought together participants from many parts of the world as well as the USA as a result of 20 years of Deep Listening Retreats and hundreds of workshops. The community of Deep Listeners is large and this is the first of more conferences to come. The conference was excellent and the atmosphere was joyous. There were many reunions and connections with new people. The future of the discoveries through listening is very promising. Especially now that we have connection with scientific interest from neuroscientists and cognitive scientists. I have long been interested in exploring Deep Listening with interested scientists. Listening is still a mysterious process that needs more knowledge to understand. 1) Take some time - no matter where you are - sit down and close your eyes for a while and just listen. When you open your eyes consider what you heard as the "music." Later try to remember what you heard and express it with your instrument or voice. 2) Another time - sit down with your instrument and just listen with your eyes closed. As you realize that whatever you are hearing IS "music" allow your instrument or voice to enter this musical stream. Stop when the music is over. This is supported improvisation. * All exercises and scores taken from the forthcoming publication, Sounding the Margins, by Pauline Oliveros, 2010. In the “dissolving ear plugs” exercise you mention classically trained musicians, but open the practices up to all. Since you began this work with “Sonic Meditations,” you have always emphasized that no particular skills or musical training is required. Can you share a bit about what you’ve found interesting/enlivening over the years in working with “nontrained musicians?” What do these listeners/makers bring to group sound improvisation? Pauline:  It is remarkable to see how creative non-trained musicians can be. Often trained musicians need to be released from their training in order to access their own creative selves. I most enjoy experiencing the creativity that is inherent in all human beings. MS: The inclusive, participatory, improvisational nature of your work—and its way of pulling a people out of narrow self and into wider life—brings to mind David Abrams’s book The Spell of the Sensuous, which explores how the individual is continuous with the land and with others. A theme of the book is that perception is participatory, that “participation is the structure of our perception.” It feels like this understanding is central to your work. Could you share some of what you have learned about this through your work with improvisation/others/listening? Pauline: I am familiar with The Spell of the Sensuous. Participation is interaction with others in ways that amplify experience so that it can be perceived. Others act as mirrors to your own participation. MS: Part of this participation is the fact of ecological continuity/interplay; he mentions us hearing the forest, but the forest also listening to us. Do you sense place in this way in your own work with listening? Pauline:  I always listen to my environment. So my performances begin with this listening and I join in as I improvise. If I am out of doors whatever is living joins me as well. It is most pleasurable to be joined by birds and insects. MS: This brings to mind your work on Troglodyte’s Delight where it feels you and your fellow musicians are having a conversation with cave water and echo. Can you say more about this experience or any new work that interacts with space/place? Pauline: In Troglodyte’s Delight we indeed were listening to the cave and cave waters and joining those energies with our improvisations. MS:  I read somewhere that you recently did a piece on fracking—what was the listening/improvisational process there? Pauline:  The improvisation for opposing fracking was simply me listening for the energies that were present for the performance. Some were local farmers who are threatened by fracking. Others were there to support them. By focusing my attention on their energies I hoped to join them with my music. MS: Part of what Abrams looks at (consonant with practice-based traditions like Buddhism/Taoism) is the negative aspect of words, how they freeze the flow of the processual nature of things. I’ve been thinking about your work with sounding as a way of opening up our fixed/readymade words, so we come to new ways of seeing/being. Part of this is how sounding might be a way of opening further to others (humans/animals/places). Can you share a bit about what sounding is? And how it flows from listening? Pauline:  Sounding is primal. From the first cry sounding is an emotional expression. The baby sounds to make needs known and as a form of pleasure. When we are born we have far more neurons as infants than adults (trillions). By six months of age we have sloughed off millions of neurons that are unused because of the narrowing of attention to the learning of language. At birth we are receptive to all sounds and can learn any language. This open ability has diminished considerably by 18 months of age and sounding begins to change. MS:  In Deep Listening: A Composer’s Sound Practice, you say, “Animals are Deep Listeners” and you speak of “animals as receiving us” in their listening. There’s a growing awareness that in losing species we are losing dimensions of not only the world but ourselves/own capacities. It feels like your practices address this in a deep way. How can we learn from listening to animal voices? From listening to their listening? Pauline: Though repetitive sounds from animals may seem simple it is possible to hear much more by listening openly. There is much more variation to be discovered in animal voices. This kind of “singing through” feels to be part of your work, work that calls up and calls out to the wider, more-than-human world. Can you share a bit about what this “singing through” is like for you? What role does sounding back have in learning from the animals? Pauline: By listening with wholeness of attention and awareness the joining with the animals can take place. The environment of living creatures is always listening. There might be a synchronization of brain waves. If this happens then there could be a mind to mind transmission of information that could not happen through words. MS:  This voice shaped by animal resonance is found throughout your work, (such as the sweet whirring of “Bye Bye Butterfly” and the frog ponds of Alien Bog). And these animal voices you call/recall nature through are often shaped by technology. Another instance of how your work inhabits between spaces. How is technology continuous with nature in your work? Pauline: I always listened to the rich textures of birds and insects when growing up in Houston Texas. Their voices were woven together in a dense canopy of sounds that I loved very much. When I began to work with electronic music I discovered that sounds that I was making resembled the sounds of birds and insects. Electronic modulations of sounds was close to the way that some of the creatures make their sounds. In your book, Deep Listening: A Composer’s Sound Practice, you say, “Breathing is a bridge between voluntary and involuntary—the sympathetic nervous system and parasympathetic nervous system, the conscious and unconscious, the inner and the outer.” Can you say more about breath as a bridge? Pauline: Breath is fundamental to life. Without breath we die. Listening to breath consciously brings us closer to the deeper reality of our life force that is involuntary. Controlling the length and depth of each breath interrupts the involuntary action of breathing, thus breath is the bridge between conscious and unconscious, voluntary and involuntary action. MS:  And in your listening work with others, you start from the body, bringing people into awareness of the groundedness of the feet and upward flow of the spine/neck. Why do you start with the body? Pauline: Connection with the body is sometimes lost when attention is focused on language (conversation, internal dialog etc.) It is essential to establish connection with the sensuous body in order to listen more broadly and also to sound. MS: And in a recent Pitchfork interview you say, “…the body is informing the mind, and our unconscious side is directed by the body…” Can tell us more about this? About what “body” means to you? Pauline: In order to perform I first need to center and establish connection throughout my body and to connect sensually with the performance space and audience. I listen in order to begin involuntarily. I follow the sound that comes from my body. The impulses that cause my fingers to move on the buttons of my instrument and my left arm to use the bellows of the accordion to articulate the resulting sounds come from a place in the body that is unknown to consciousness. What is played is recognized slightly after it happens. I do not know what pitches I am playing. My body knows. MS: Related to this is memory. I often think of the body as a recorder of more than the conscious mind knows it knows, something deeper and wider than our skin. Your exercises often ask people to remember sounds, such as a favorite sound or the sound of home… Would you also offer a bit more about how memory works as an integral part of listening? Pauline: Memory is key to listening. Without memory we could not listen. Our listening happens after sound waves are transduced and delivered to the audio cortex. Thus we are listening to memory. MS: In an early essay “On Sonic Meditation” you say that  “sound, both inner and outer, real and imaginary, is the stimulus of Sonic Meditations,” and Deep Listening today works not only with the present-momentary soundscape but also with imagined sounds. Imagination seems more subjective and more active than listening to the surrounding sound field. Or is it more like listening to the inside field, the unconscious dimension of the body? Can you share more about the role of imagination in your Deep Listening work? Pauline: I have substituted “Auralization” for “Imagination” in my work. Imagination implies visuality and auralization aurality. Otherwise there is cognitive dissonance. To auralize means to create sound in inner listening. Such sounds can come from memory or arrive spontaneously. Many of my exercises propose auralizations. This is to access creative spontaneous soundings. MS: There is a wonderful video of a masterclass you recently gave at the Sonic Acts conference in Amsterdam in which you open by saying “Listening is experience, and I would say listening is consciousness.” Can you elaborate the relationship of listening to consciousness? Pauline:  It has occurred to me that the ability to listen indicates consciousness or is consciousness. Maybe consciousness and listening are interchangeable. Currently neither listening or consciousness are well understood by scientists or artists. MS: What is exciting to me about your soundscape listening practices is that they are a powerfully accessible form of meditation. And because sound is around us all the time, listening offers an immediate and ever-present way of expanding and refining awareness. Attention has two forms: Inclusive, which takes in all that is around, and also everything internally, so you are attentive to your inside sounds and thoughts and images, whatever happens in the mental space, inner hearing, inner listening and at the same time, everything that you can perceive as outside yourself. That is “inclusive,” or “global” attention. And then “focused” attention is narrow, and it goes moment to moment. One of our difficulties is to maintain this focused attention, because it is linear, and it is moment by moment. So in this listening practice we are going to listen inclusively and also exclusively simultaneously, so that you are always expanding to the outer and inner soundworlds. Continually expanding. So that new things come in and old things go away. And if a sound takes your attention, like that creaky chair that just happened, make sure you attend all the way from its beginning to its end, so that your exclusive attention takes in all the detail of that sound, then you return to that [global] listening of everything all of the time, everything else that there is to listen to. And if you have trouble with an internal dialogue, make sure you include it, and listen to it as well, that you include it, along with everything else that is sounding. If your internal dialogue gets louder than whatever else there is to listen to, then just turn it down, turn the volume down. Pauline:  Space-time continuum is the whole of where we are. Space-time is an inseparability of the human condition on earth. I wish to direct attention to the vastness of our universe as well as the limited locality that we occupy. Listen to sound disappearing. This meditation that I practice takes one to the border of reality and virtuality. When do you stop hearing the sound? When does memory begin? These questions show roots of your listening practices in your study of Buddhism and Taiji. And these traditional systems are not dead structures; they’re about exploring our own embodied lives—which is what your listening practices are all about. Can you say more about how Eastern approaches have nourished your work? Pauline: I came in contact with Tai Chi in the early 70s after I had begun my own explorations into what I called Sonic Meditation. I sometimes accompanied Al Chung Liang Huang’s Tai Chi classes with my music. I also began learning the Tai Chi form. I began to translate breath to my accordion bellows much as breath connects with Tai Chi moves. So gesture from Tai Chi and later from Karate began to inform my work. MS:  I find in exploring your listening practices that the elusive Buddhist idea of “form is emptiness/emptiness is form” takes shape more. That listening (to soundscape or drone or a single sound) teaches something about what this means—revealing experience/consciousness as textured, intricate, layered, not linear, and also moving, constantly shifting. Because sound is not as “solid” as visual things…it’s more diaphanous, more porous…it includes silence…Through attending to sound we can directly experience the fluidity and interplay and fleetingness that is the “emptiness” of things… How do you keep deepening this experience? Pauline: I keep deepening this experience by continually practicing listening. I listen to sounds and I listen to silences. You can’t have one without the other. I can shift focus to sounds or to silences or to both. MS: How one can deepen listening in a society where "multi-tasking" is more of the norm? Even with music, people seem to listen while jogging, driving in the car, working on the computer, etc. Pauline:  Listening in this case is likely to be what I refer to as global or inclusive rather than focused or exclusive. The body senses and feels the music that supports focus to the task that is performed. Exclusive attention can only be given to one thing at a time and must be refreshed moment by moment. Understanding this can help to deepen experience. MS:  In learning to listen is there a need for more silence… less sound field? Or can we learn to find silence in the sounds? Pauline:  If you are trying to focus (moment to moment) then the strength of your intention is important. Otherwise your focus may instantly change to something else. Maintaining focus is not necessarily easy depending on the strength of distracting sounds. (Sounds that demand attention). The ability to expand global or inclusive attention while maintaining a focus can help. Some people need quiet in order to maintain attention. Others can focus amid chaos. There are many different orders or levels of abilities. It is helpful to learn to flex both kinds of attention and to maintain both exclusive and inclusive attention simultaneously. MS:  It strikes me how this stuff is not abstract—it’s about experience. In that same recent interview you said, “I am also interested in music expanding consciousness. By expanding consciousness, I mean that old patterns can be replaced with new ones.” How have you experienced this (recently or in the past)? Pauline:  Recently I have written music for a new opera that is still in progress and also a new commissioned piece: Concerto for Bass Drum and Ensemble. I noticed that though I have not used conventional notation for a very long time that it was much easier for me than ever before. MS:  I’ll share a kind of funny one about listening breaking old habits. I learned to drive in a traffic-jam infested east coast city, one filled with aggressive drivers ready to mow you down. So there is a bit of atavistic frustration in me that simmers in heavy traffic. But the other day, in the midst of this interview process, I suddenly thought to listen to the soundscape in the midst of highway traffic. It was amazing. It was beautiful. All these little air sounds of cars swishing by like little rivers and this moving mosaic of music from car stereos, then the rivers of air, then the passing patches of music…It was lovely, and it was new, and it was fun—and this opened everything up. Have others remarked on sound/remembering to listen opening up their world in the heat of stress or conflict? Pauline: Many people have commented on their listening experiences as life changing. For me I am listening all the time to the music that is the world sounding. I have learned to give stress up to this kind of listening. MS:  Listening in the ways you suggest leads to hearing sounds as music and to noticing that beautiful sonic arrangements are constantly happening in everyday situations. You observe this in your essay, “Quantum Listening”: “the [sound] field seems to have a unified logic and form as if it were a composed piece of music.” Or as a fellow interviewed artist here, poet Susan M. Schultz, says in her book Dementia Blog, “The situation is the poem; you need only take it down.” Is that how it works for you sometimes? in terms of composition? Can you share about a recent piece—or perhaps one you are working on right now—and how it has roots in the everyday soundscape? Pauline: Yes I appreciate the music of everyday life every day. After the Deep Listening: Art/ Science conference held in July at the Experimental Intermedia and Performing Arts Center at RPI with 75 presentations and 110 registrations a musician and birder friend said that he had a new kind of listening experience with birding. He said that instead of just identifying the bird that he was hearing that he dropped out of that mode of identifying and simply listened to the bird. To his surprise he heard the bird make patterns that he had not heard before. The bird would call then fly away and return and call again. He noticed that on each return the bird added one sound to the pattern. The bird was counting! It so happens that I have written Concerto for Bass Drum and Ensemble with three movements: I Birds, II Animals and III Humans. After writing the instructions for I Birds I found myself listening differently as well and discovered the very delicious patterns that birds make as solos and ensembles. I had written this piece before my friend related his experience to me. There are amazing patterns to be heard differently everyday everywhere. MS:  The cicada festival at DLI seems part of this music of the everyday, can you share a bit about what you performed there? Pauline: During the amazing emergence of the septindecimal Cicadas in June 2013 exactly 17 years from the first emergence that I experienced and celebrated with a Festival in Kingston NY there was a second Cicada Festival. This emergence is not exactly of the everyday except for about 6-8 weeks during that “eat, fly, mate, die” panorama of extraordinary sounding with billions of calling male Cicadas. I feel lucky that I have experienced this mysterious phenomena that is indigenous to the Northeast. Cicadas are harmless and have no predators (except humans). They are maligned, abused and eaten. However artist and musician friends and I have chosen to celebrate the emergence and sounding. Musician David Rothenberg has traveled to many places in the world playing with and collecting Cicada and other insect sounds. He has written a book - Bug Music: How Insects Gave Us Rhythm and Noise. His book encapsulates my relationship to the sounds of insect life as well as birds and animals that I have enjoyed all of my life. In Rotary Park during the Cicada Festival we performed together with live Cicadas that David placed on the microphone. He played Brood 2 Cicada sounds that he had collected and the cicadas on the microphone sang as we performed with them. From across the Hudson River we could hear the faint din of the Brood. MS: Meditation cultivates a kind of raw or unmediated experiencing, a bare awareness that sheds preconceptions. And your work is unique in that it brings together meditation and art to a degree that other artists do not venture into, perhaps for fear of dropping the reins of control or familiarity, of not-knowing, of letting that unknowing lead…As a listener and an improviser you are tuned into this more open, noninterfering appreciative mode. Yet you are also a composer. How is the wide-open, nonjudging mode of listening to the sound-field different than the more discriminating mode required for composing? Pauline:  As I teach Deep Listening we have two modes of listening: Inclusive or open and exclusive or focused. Focused exclusive listening has to be maintained moment by moment continuously. This form of listening is associated with discriminating mode of listening required for composing. However it is necessary to be open for what is to be composed. So both forms are essential to composition. MS:  Would you offer a sonic meditation for spacecraft voyagers? Sounds are ever present tickling our ear drums & skin, passing through & around us 24/7. Though heard & felt most often we don't listen to the sounds of everyday. Give yourself a moment - catch the sounds around you & savor a sound. Follow the sensation of what is sounding. Maybe it's a chattering keyboard, a printer buzzing, a bird singing or so many other possibilities. Follow the harmonies of life sounding in an around you with full attention. Love the sounds & they will love you back. Savor sound & savor life.